In what was one of the more professional laden final tables in recent memory, Allen Cunningham was able to overcome an excellent final table and take away the title of champion in Event #13, the $5000 Pot Limit Hold 'Em tournament, making history at the same time. The players shuffled chips around for the first two dozen hands, easing in to the feel of their opponents at the final table. On Hand 24, though, we would lose our first competitor of the day in Alan Jaffray. Jaffray, who has been playing excellent poker in the early going at this year's World Series, left the Rio for the day in ninth place and earned a decent $31,800 for his three days of work. On Hand 41, Keith Lehr got involved in a three way hand with Gavin Griffin and Jeff Lisandro and they saw a 8-7-6 rainbow flop. Griffin fired out a 125K bet and Lehr pushed all in. Surprisingly, Lisandro responded with an all in over the top move himself, forcing Griffin out of the hand. Lisandro tabled pocket Queens for the lead over Lehr's pocket tens and, once none of the outs Lehr needed came on the turn or river, Keith Lehr was knocked out of the tournament in eighth place, taking home $43,959 and Lisandro became the dominant chip leader in the event. The very next hand, the defending champion of this event Jason Lester was able to double up through Lisandro. Lester raised from under the gun and Lisandro came along for the ride from the big blind. After a K-10-3 flop, Lisandro bet out 100K and Lester almost beat him in the pot with the remainder of his chips to call. Lester had flopped a set of threes, easily outflopping Lisandro, who had flopped middle pair with Q-10. Once the turn blanked, Lester was back in the hunt. Lisandro continued to spread the chips out around the table on the very next hand, this time losing more of his chips than on the Lester hand. Humberto Brenes got in with the best of it against Lisandro with A-Q against A-3 and, after the board once again didn't help the Italian based Aussie, Brenes doubled up to 840K in chips. Even after these two double ups, Lisandro was still the chip leader at 1.05 million. Lester was able to cut some chips from Brenes' stack on Hand 57 when he was all in and hit runner runner to catch a straight, pushing Lester slightly ahead of Brenes. Twelve hands later, Lisandro replenished his chip stack when he eliminated Gavin Griffin from the final table. After Lisandro limped under the gun, Griffin pumped the pot out of the small blind to 120K and Lisandro called. On a flop of , Gavin pushed all in for 185K and Jeff immediately called. The two pros both had big hands; Griffin tabled , but Lisandro was ahead with his - . A Jack on the turn increased Lisandro's lead. Griffin still could make a straight, but didn't want to see a diamond. The river made Griffin's straight, but it was a diamond and Lisandro vanquished Griffin with a flush over a straight (check out our Feature Hand simulator to see this hand and other big hands from the final table.). 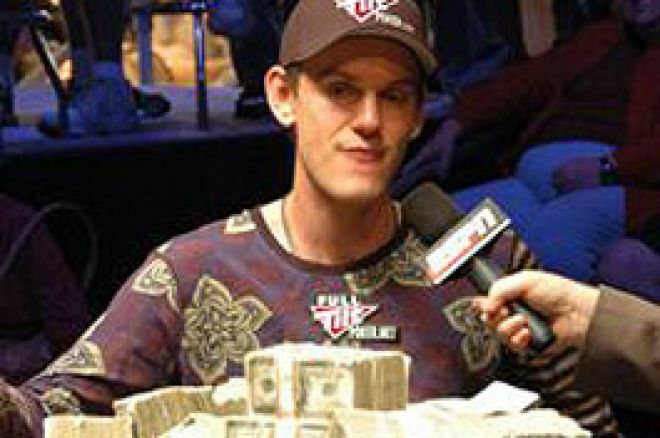 Griffin was out of the tournament in seventh place, taking away $58,924 from the Rio's cage. In what would become a familiar scene at this final table, Cunningham extended his lead when he took a 780K pot against Lisandro with a Queen high flush. Jason Lester wasn't ready to give his title up yet, however, doubling up through Joe Patrick to stay in contention. That all changed in one of the most exciting hands of this tournament on Hand 93. Joe Patrick made a raise of 140K from the cutoff, only to see more action behind him than he would have liked. Jeff Lisandro re-raised from the small blind to 300K and Lester made his stand with all of his 580K stack. Patrick moved the remainder of his stack to the center (a total of 285K) and Lisandro called them both, showing pocket Queens. Lester would be in the race against Lisandro with his Big Slick and Patrick had the worst of it with his pocket sevens. Although there were several bullets to be dodged, the board brought none of them for his opponents and Lisandro had a double knockout. Patrick, lower in chips than Lester, took away the fifth place prize of $99,142 and Lester, in the best defense by a defending champion yet in the 2007 World Series, was out in fourth and earned $132,813. Just before the dinner break, the table would be down to a heads up match. On Hand 101, Humberto Brenes made a move, re-raising Allen Cunningham with all of his chips. Cunningham was happy to call with his A-Q and Brenes' could manage only a 10-9. As the board came with a Queen to move Cunningham further into the lead, Brenes still entertained the fans assembled at the ESPN Final Table by swimming his shark around the table. Lisandro joined in the show with a fish hook and the crowd enjoyed the show. Cunningham enjoyed seeing the turn and river blank out for the popular Costa Rican pro and Humberto Brenes was eliminated in third place, taking a $197,348 prize and showing his joy in playing poker. With the blinds at 20K/40K, Cunningham and Lisandro started an epic battle that lasted eighty hands. For much of that fight, neither player could get a firm grasp of the chip lead as it switched back and forth with neither player ever enjoying more than a 400K chip lead. On Hand 180, though, Cunningham took down a pot of over one million in chips to seize a 3-1 lead over Lisandro. The tournament would come to an end on the very next hand. With the blinds at 40K/80K, Lisandro raised from the button to 165K and Cunningham responded with a reraise to 495K. Lisandro pushed the remainder of his stack into the center and Cunningham called, showing K-9 to Lisandro's pocket Queens. The flop kept Lisandro in the lead, but a King on the turn gave the lead to Cunningham. Once the river ran dry for Lisandro, Allen Cunningham was crowned the champion of the $5000 Pot Limit Hold 'Em event. With the victory, Cunningham earned his fifth World Series bracelet and also became the fifth man in World Series history to capture a bracelet in at least three consecutive years. Only Johnny Moss (74-76), Doyle Brunson (76-79), Gary "Bones" Berland (77-79) and Erik Seidel (92-94) can claim such success at the World Series, but it was a tough battle for Cunningham all the way. As his friends congratulated him, Allen Cunningham could only humbly soak in the awe of his fifth championship in the World Series of Poker.